College Station is a quintessential college town located right in the heart of Texas, about half way between Dallas and Houston. This town may have all the amenities of a big city, but the area is known for its wholesome values and friendly small town attitude. The people here are well known for their big Texas smiles and welcoming natures. It’s safe to say that basically everything in College Station revolves around Texas A&M, one of the five largest universities in the country. Oh, and did we mention that TAMU has some of the most spirited students around? This area lives and breathes Texas A&M, so much so that it’s often called “Aggieland.” If your idea of good time is two stepping to some shoe-tapping country music or tailgating at a college football game, then you’ll find yourself at home quickly at College Station! College Station is a fabulous locale for those with a love of warm weather. The summers can be sweltering, but the winters here are admirably mild. The temperature rarely dips lower than 60 degrees! When you’re a small college town hosting a large university, your housing options can get narrow pretty quickly. Most Texas A&M students begin finding roommates and searching for the perfect place in January or February. In May, many students are touring apartments and signing leases. By August, most affordable rentals near campus have been snatched up. Do yourself a favor and begin your search as early as possible to have the best selection of places. Searching for an apartment in College Station can be tough. That's why we scour the web to get all best listings around town. And our team of local experts verify the quality and accuracy of those listings to make sure that you have the best prices, images and information available. So unlike searching for an apartment on Craigslist, you can be sure that ABODO’s College Station apartment listings are safe, trustworthy and accurate. College Station is known for being a typical college town, but with a more socially conservative feel. You can drive down George Bush drive to access the Barbara Bush Conference Center and the George Bush Presidential Library. Though people are open to all faiths, it’s also known for being a largely Christian area. This can be a very appealing area for college students looking for the university lifestyle without the liberal attitudes normally associated with higher education. Texas A&M is a sprawling campus, so having knowledge of your transportation options is essential. Luckily, the area is easily bikeable and has an extensive bus system that makes frequent stops. Having a car for off-campus living is recommended for the sake of convenience, but the town is relatively small, so getting around typically isn’t an issue for students. There are public buses and taxis available for a small fee. If you love tailgating and two stepping, then you’ve found the ultimate town for you! There is little that this town loves more than a good Aggie football game. Let’s just put it this way: It’s not unusual to see tumbleweeds rolling down the street during a football game. Aside from being the home of the Aggies, it is also a hot spot for country music lovers. Enjoying some live music and going two stepping at one of the many country clubs in the area is a beloved pastime for College Station natives and visitors alike! Aggieland's main attraction is TAMU itself, but there are still a few awesome places that you can visit outside of campus. One fav activity is to go on a wine tour of some of the surrounding vineyards, which often mix a few glasses of delicious reds and whites with the down-to-earth twang of country music. Head over to Bryan for a fun-filled afternoon at the Lone Star Trapeze Academy, where you can learn to flip and twirl in the air with the experts! College Station is no New York City, but for a town of its size, Aggieland offers a lot of variety. There are prime Tex-Mex hangover cures to be found at the Fuego Tortilla Grill, who offers breakfast tacos that are to die for. Grab some cheap n’ greasy eats at Antonio's Pizza By The Slice. They may only offer one or two options, but quality over quantity definitely applies here! You can pull out all of the stops for your date at The Republic, an upscale steakhouse known for its excellent service, delicious cuts of meat, and tasty cocktails. These are only some of the many dining options you can dig up in the College Station area! Considering that College Station has its roots in TAMU, it’s little wonder that college dives and dance clubs are abound. Bar hoppers should look to the Northgate District, an area right across from TAMU’s campus that’s brimming with bars and restaurants. Though there are tons are bars to choose from in this district, you can be part of a long-standing Aggieland tradition at The Dixie Chicken. This bar’s success can be credited to its health mix of ice cold beer, awesome drink deals, and good ol’ country music! If you want to wander outside of Northgate, Bryan also boasts some great two-step dance clubs and a few more upscale cocktail and wine bars. College Station may not be brimming with art museums, but one of its most interesting cultural centers by far is the George Bush Presidential Library and Museum. Located at TAMU, this library serves as both an epic archive for research and a museum of George Bush’s life. In many ways, this library serves as a historical archive of the late 20th century, containing documents, exhibits, and educational programs that are meant to show the significance of the presidential office and American History. Why so acclaimed? Even people who aren't history buffs come of this museum singing its praises. The Brazos Valley Worldfest is easily one of the most vibrant and fun events that College Station hosts every year. Live music and dance acts from around the world take to the Wolf Pen Creek amphitheater in late fall every year. In addition to watching talented performance make great tunes and bust a few moves, you can also enjoy the regional cuisine, shop imports, and check out various cultural displays set up by TAMU diversity grounds. The Brazos Valley Worldfest combines learning with good ol’ fashioned fun, making it one of the most beloved fests in the area! College Station is no shopping mecca, but it has its options. Post Oak Mall is the largest in the area, featuring 125 stores ranging from small boutiques to national chains. It also has six different department stores, giving visitors a wide variety of choices. For a more intimate vibe filled with local shops, hit up historic Downtown Bryan a few minutes away from campus. These brick-fronted shops offer vibrant, one-of-a-kind products that you'll have difficulty finding anywhere else. Whether you're searching for that perfect LBD or a unique piece of art to grace your new apartment, you're bound to find something special in Downtown Bryan! Just in case you missed the memo, this town lives and breathes college sports. After all, it's called Aggieland for a reason! You'll be hard-pressed to find someone who'd pass up attending a TAMU football game at Kyle Field. It’s not unusual to see a tumbleweed or two rolling down the streets on game day as thousands flock to the stadium for some spectating and tailgating. Locals and students alike also get pretty excited about basketball and baseball, but the famous fervor Aggieland is known for is mostly reserved for football fandom. 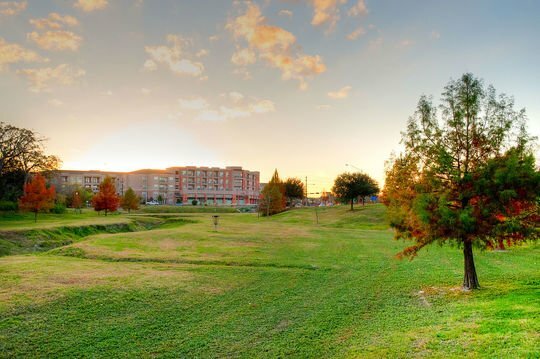 College Station is home to over 2,000 acres of parkland, but few pieces of green space are more beloved than Wolf Pen Creek Park. Located right in the heart of town, this beautiful park features gentle rolling hills and quiet landscaping – leaving a ton of room for lounging in the grass or just horsing around! Paved paths make walking and biking a popular activity here. The disc-golf course is also a fav, but the park’s outdoor amphitheater is what truly sets it apart from all others. you'll find yourself visiting Wolf Pen Creek often for fests, shows, or just to catch some rays!